What does an Estate Administrator Do? The Estate Administrator has a significant role in executing the direction(s) given by the deceased individual (legally known as the testator). Some of the responsibilities may include, organizing the memorial service; filing an application for probate; dealing with banks and other financial institutions; filing tax returns, etc. The level of responsibility will depend on the assistance from the estate lawyer and accounting firms. 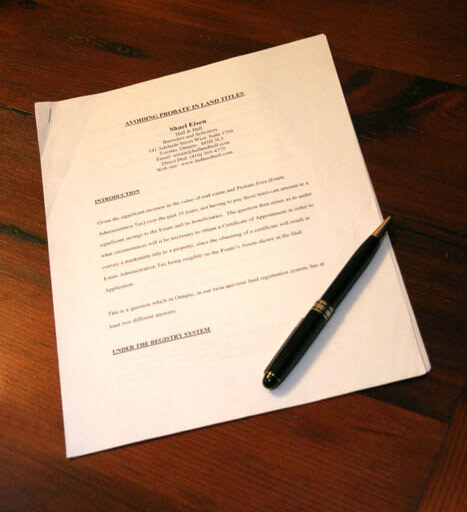 At the The Mobile Lawyer, we assist at all levels from administering an entire estate to helping the estate trustee(s) file an application for an appointment of An Estate Trustee With/Without a Will. Chattel mortgage – When an interest is given on moveable property other than real property (in which case it is usually a “mortgage”), in writing, to guarantee the payment of a debt or the execution of some action. It automatically becomes void when the debt is paid or the action is executed.